Most people have a gap between in the inner side of the foot and the ground when they are standing. This is referred to as an "arch". Small children do not have an arch, the arch begins to form between the ages of 3 and 10. Feet that have a high arch are sometimes referred to as cavus type feet. Red, painful, swollen area at the back of the heel bone. A large enlargement of the back of the heel bone. Pain at the back of the heel bone. Patients may experience pain when the ankle is moved; this is due to the irritation of the Achilles Tendon. The enlarged bone rubs against the shoe and can lead to a bursitis of the heel. This will cause extreme pain and make wearing shoes very difficult. The main cause of an haglund deformity is poorly fitting or inappropriate footwear. The underlying bone deformity may be present at birth; an abnormal shape heel is more susceptible to this condition. Skin irritation caused from footwear can lead to a bursitis. Mechanical problems with the feet such as "over pronation". Over pronation can be simply described as a condition, which causes your arches to flatten out when you stand up. This causes your ankles to roll in towards each other and disturbs your normal walking pattern. If a foot over pronates the structures of the foot are put under stress, which increases the likelihood of an Hagland Deformity occurring. 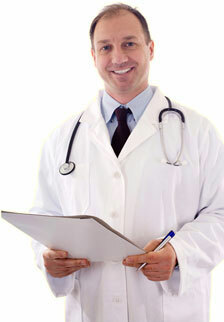 In cases, where the bone enlargement is considerably large, surgery may be required. Your doctor may prescribe you with Cortisone injections for relieving pain. However, the use of such injections for prolonged periods may lead to occurrence of certain other abnormalities related to foot such as Achilles tendon rupture. Use of anti-inflammatory medications and immobilization are other options available for treating Haglunds deformity. 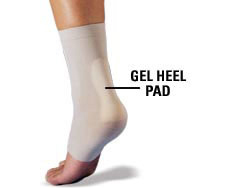 The toeless sleeve moulds to the foot, securing the polymer gel pad at the Achilles tendon to absorb pressure and friction. Amazing relief from hagland heel, bursitis and other heel maladies. The gel also slowly releases a medical grade mineral oil that softens and moisturizes the skin. 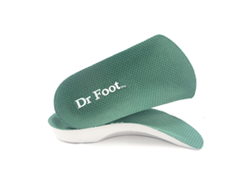 "The Dr Foot Insoles support your arches and reduce muscle activity in the lower leg, improving comfort and performance."